Click on the DONATE button to instantly make your donation to Deirdre’s House. Deirdre’s House is the Center in Morris County for child victims of abuse and/or neglect and for children that have witnessed domestic violence. 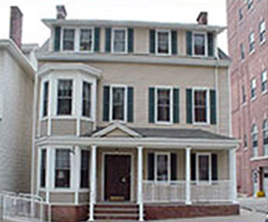 Established in 1994, Deirdre’s House is the only site in Morris County where a child victim can be interviewed and digitally recorded by law enforcement, medically examined and treated by a pediatric abuse specialist, prepared for trial, and clinically counseled in English or Spanish—all under one roof. What does Deirdre's House mean to a child victim? It means that a child victim will not have to be interviewed and processed at a police station, examined in a hospital emergency room, and counseled at yet another location. It means that an already badly traumatized child will not be retraumatized by the very system that is trying to assist them. It means that free, state of the art care is available on an immediate basis, because the longer a child victim waits for treatment the less likely they are to fully recover from the trauma they have experienced. Most importantly, it means that a child’s life may be altered by abuse, but not defined by it. Barbara Pagos, and Jeff and Nancy Rich. 2016 Copyright Deirdre's House. All Rights Reserved. Our design company is Monarch Communications, Inc.